Why should people bother to buy from you? In today's increasingly competitive marketplaces, people have a choice. They can buy from the 'me too's or they can buy from the market leaders. Bright Marketing argues that in a world full of mediocrity it only takes a 5% difference from the competion to stand out. NB All postage and packing quoted is for delivery to UK - overseas orders will be despatched at cost. £10.99 including postage and packing. Personally signed by Robert Craven. 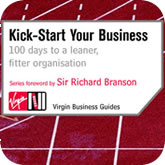 Written by Robert Craven with a Foreword by Sir Richard Branson. Running a business can sometimes feel like running up the 'down' escalator. Unless you can get your business to work for you. Kick-Start Your Business uses a practical, hands-on approach to putting your affairs in order. If you are the same as your competitors, then why will anyne want to buy from you? And, therefore, how do you separate your business from the rest? 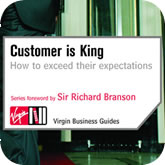 In a world where, increasingly, profit rules Customer is King is about putting the emphasis back on the customer - what happens to your customers when you do business with them? Buy Kick-Start and Customer is King together for £18.00 including p&p.